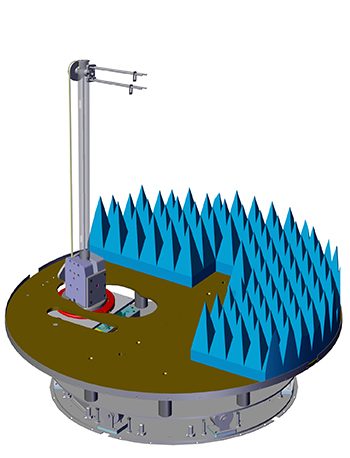 ETS-Lindgren’s Model 2110CR Light Duty Multi-Axis Positioning System is designed to perform measurements of spherical antenna patterns, plus total and effective isotropic radiated power of wireless hand-held devices. The 2110CR is a modular, light-duty multi-axis positioner, consisting of a rotating turntable base with a mounting mast. This configuration allows for independent rotation in both the azimuth and ortho axes and accommodates wireless handsets up to 0.45 kg (1.0 lb). To minimize any potential RF obstruction or distortion of RF signals from low directive wireless transmit antennas, the rotating shaft assembly is constructed of low reflective dielectric materials.